Bombardier Commercial Aircraft announced today that its CS300 airliner has been awarded its Type Validation by the U.S. Federal Aviation Administration (FAA). 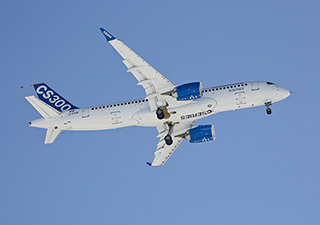 This most recent approval means that both the CS300 aircraft and the smaller CS100 aircraft are now approved by Transport Canada, the European Aviation Safety Agency (EASA) and the FAA. The FAA recently conducted an operational evaluation on the CS100 and CS300 aircraft and determined that both aircraft will share the same pilot type rating — allowing operators to benefit from significant cost-saving opportunities. “The SWISS CS100 airliners have had very strong in-service performance to date and are now in their fifth month of operation; and earlier today, the CS300 aircraft entered revenue service with airBaltic’s first passenger flight from Riga to Amsterdam. By also announcing the FAA’s Type Validation on the CS300 aircraft and the same pilot type rating for the CS100 and CS300 aircraft, we are truly having an exciting day and are very proud of meeting all these key C Series aircraft program milestones!” said Rob Dewar, Vice President, C Series Program, Bombardier Commercial Aircraft.